Sworn to Transfer definitely exceeded my expectations. If you’ve read my review of Sworn to Raise, you’ll know that I felt it didn’t live up to its potential. Well, its sequel clearly did. Terah Edun stepped it up for this book, and it captivated me. The writing is vivid and detailed, and the plot was well-paced. I also loved getting to know the characters better. After this book, I’m incredibly impatient for Sworn to Conflict! This book picks up a couple months after Sworn to Raise left off. Ciardis is comfortable in her role as Companion trainee, but things soon start to go wrong. Not only is she meant to protect Prince Heir Sebastian, but herself, too. Attempts are being made on her life, and the kith of the Ameles Forest are being killed off. The atmosphere in this book is laden with mystery and suspense as Ciardis strives to figure out who this enigmatic yet powerful murderer is. Ciardis has really grown into her character, and I loved seeing that. She’s impulsive yet kind-hearted, and she’ll do anything to save the innocent from dying. She’s tough as rocks, and won’t let anything stand in her way. I love her brazen attitude towards everything. It’s definitely different from the other women around her. Ciardis also learns a lot about her powers as a mage, and the fact that she can do more than just enhance the powers of others. I wish there was more of Sebastian in this book, though. I missed him for most of it. Sebastian has grown too, but in a different way. He’s becoming more of a man than a boy, and as a result people have begun to respect him. Even Ciardis sees him in a different light. There wasn’t any romance in this book, either, but I think there surely will be in the next. I feel like Ciardis’s and Sebastian’s relationship has strengthened, and may become something more soon. I hope it does! Their age difference didn’t matter to me in this book, not like it did in Sworn to Raise. Maybe because Sebastian seems older. Either way, I’d love to see a romance develop between the two of them in the third book. I loved the world building in Sworn to Transfer. We get to see exactly how mage powers work, and how Ciardis is trained to control hers. The detailed description of the mage cores put a clear picture in my mind, and I love it when authors can do that with something as abstract as magic. World building like that is difficult in a fantasy novel, and Edun has definitely pulled it off in this book. If this series keeps getting better, I can’t wait to see what’s in store for us in Sworn to Conflict! The action in this book is as riveting as it was in the first one, and there was more of it. I loved the danger streaked throughout, with the kith murders and the enigma of the Shadow Mage. We are introduced to some new characters, too, and I’m looking forward to getting to know them more in the next book. Overall, this was an awesome read, and if you’re a fantasy lover, this is one world you don’t want to miss out on. Thank you to City of Books for such an amazing review. It brings tears to my eyes and I’m so glad that from one book to the next the series has drawn you in. 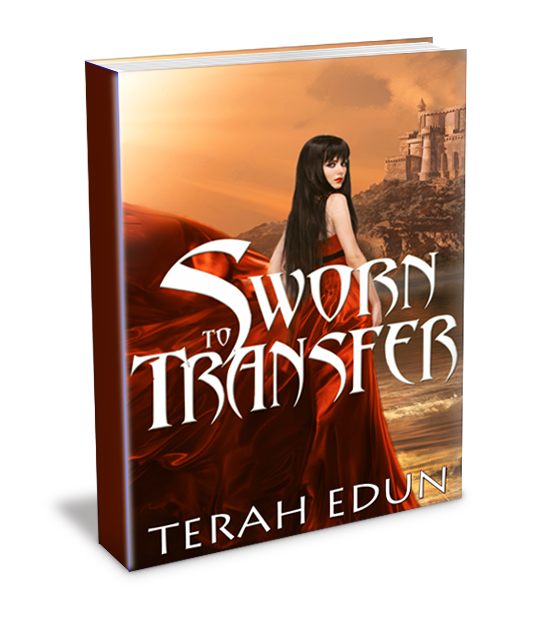 Sworn To Transfer, the second book in the Courtlight series is now out. You can pick it up at Amazon, and Barnes & Noble. iTunes will be coming later. I’m proud to say that this book is longer, more captivating and even more magical than Sworn To Raise! But don’t just take my word for it! Check out these NetGalley reviews that praise Sworn To Transfer and compare it to two of my favorite authors – Tamora Pierce and Sara J. Maas! “And Yes! I was captivated from beginning to end. Edun’s writing style does remind me somewhat of Tamora Pierce and Sara J. Maas. Ciardis Vane is the archetypal abandoned/orphaned heroine raised to believe she is a gypsy but is in reality is a Mage, a Weathervane, the last of a line of mages whose major talent is increasing the powers of others. Her gifts come to light when she is taken to be trained as Companion. She goes from drudgery to a position of prestige–albeit dangerous. Of course there are evil mages and careless, selfish mages, friendly trainees and courtly intrigue involved. Now, after the Patron Hunt, having helped save the Prince Sebastian, the heir to the Algardis Empire, Ciardis is Companion trainee to Prince Sebastian, even though the relationship has not been formalized and Sebastian has been avoiding her. ‘Transfer’ opens with Ciardis on a ship in the middle of an icy storm waiting to meet an ambassador from Sahalia who turns out to be a dragon. Something is attacking the kith (the original, magical inhabitants of the kingdom) in their stronghold, the Ameles Forest. Death and destruction most horrible is being visited. Of course Ciardis joins the group sent to investigate. It seems a shadow necromancer is at work. There are times when Ciardis is unsure of whom she can trust. When the battle is engaged she acts as usual, on impulse. My vote though is that rather than impulsive she is young in her powers. What she uses is her magely intuition although it does have an edge of the impulsive. Unfortunately that intuition does have the habit of leaving her in an even bigger hole. “I would highly recommend reading book 1 of the Courtlight series, Sworn to Raise, before reading Sworn to Transfer, as certain things will be much more understandable. Once more I was super excited to read the sequel to a book that I really enjoyed, and Sworn to Transfer did not disappoint! Though in my mind, it was completely different to the first book, both in tones and events. Ciardris as a character is much more assured in herself, and in her powers, which as you can imagine, makes the impact as her as a character, different. Though interestingly, as well as her good personality traits becoming more pronounced, her faults do too, particularly when she acts a little vain. She is also incredibly girly compared to other book heroines, and the thought of getting dirty really doesn’t sit well, at times I thought this could get a little annoying, but as a whole, it made her ten times more human, which is necessary considering how massively overpowered Ciardris is! I love the way that Edun manages to make it so that her characters solve the problem accidentally, you can see how the accidents fall together to create the solution, but at the same time it means that characters don’t have to suddenly know something that they had no clue about before. I realise that this way of writing may annoy some readers (though not me! ), but its consistency should prevent that. A storm was rolling in off the coast of Sandrin. Heavy rains buffeted the docks and high winds whipped the ends of coiled loops of thick sailor’s rope up into the air across the deck of the large ship. Ciardis Weathervane huddled miserably as she felt the ice-cold wind and rain buffeting her every few minutes in steady waves. First the cold rain would slice into her face, and then a heavy stream of frosty air would strike, pushing her cloak back and soaking her front. Still, she stayed where she was, and she fought not to shiver under the thick blue cloak that she wore. Prince Sebastian wasn’t far from her side. If you could call across the ship with dozens of soldiers between them “not far.” It was the closest he’d been to her in weeks, though. Ciardis felt her heart clench just a little when she thought about that. The distance that seemed to have grown between the two of them wasn’t only physical. Shaking off her nerves and turning from the railing where she gazed pensively down into the gray, churning water of the ocean, she took in the gathering around her. To her left stood a living hedge with hair, eyes, chattering teeth, and she was sure, frozen fingers. The guards stood at attention in neat rows with upright pikes in their right hands, their left hands gripping sheathed swords at their waists, and their golden armor dripping wet in the downpour. Staring stoically ahead to a man—and woman—the Prince Heir’s guard didn’t flinch at the monstrous sound of thunder and lightning cracking down over the ocean to the east of the ship. Until ten minutes ago, Ciardis had been standing under the shelter provided by the Weather Mage traveling in the Prince Heir’s retinue. She’d left to get some air, frustrated with her own self-doubt. It had been three months since she and Prince Sebastian had killed the Princess Heir. Three months since they’d danced on the beach in the glowing afternoon. She was trying hard to focus on her life now as a Companion trainee. But it was kind of hard to focus when you didn’t know where you stood. The Patron Hunt had been put on indefinite hold. Partially because having a Prince Heir as an interested party took precedence above all other candidates. Not that there hadn’t been some grumbling among her other candidates, but Ciardis had not objected to the Prince Heir’s monopoly. After politely sending notifications to all of her suiters, she had waited with growing impatience to hear from the Imperial Courts. Becoming a Companion to a Prince wasn’t just his decision, a lot of protocol was involved and many other people held sway. She had tried to talk to Sebastian about it. But other than acknowledging his prominance as her premier candidate, nothing had been said. And now she was stuck right back where she’d started. They hadn’t formalized their contract as Patron and Companion. Hell, they hadn’t even had discussions on what it meant. Oh she knew in theory from history what being a Companion to a powerful member of the imperial family would mean. But Sebastian hadn’t asked her. He hadn’t asked her if she wanted to stand by his side, rule in his stead in far-flung places, or act as his advisor in tempestuous times. Instead he just seemed to prefer avoiding her like the plague and attending to whatever duties his father handed out. They had a relationship she would agree, but she couldn’t say what kind. By the seven gods, in the past three months she’d spent less than three weeks in the Prince Heir’s presence. His duties had kept him busy at his father’s side in court functions and hers had kept her attending gala after gala. In coming out into the cold sea air and rain, she’d hoped to clear her mind of her worry over that bowl of worms as well as a long list of enemies that saw fit to make her life miserable. Her life in the Imperial Courts was turning out to be a never-ending series of crises. Mostly because of Sebastian – even if he wasn’t currently talking to her. A moment later a horn blast came from the front of ship. That horn was the sound that called for all people aboard to take their proper places. She went forward while wishing that the ambassador flying in by delegation had elected to hold their meeting anywhere else. Preferably a place that was warm. I wonder if they’re coming in by winged horse? The pegasi steeds would have to be very strong to withstand the fierce winds of this storm. Another ship would be more likely. Aside from that, she wondered where the ambassador would be flying in from. No one had said a word about which country this mysterious delegation was representing. As she reached the edge of the square block that made up the bulk of the Prince Heir’s guard, she saw the wind shield—the large dome that took up the front half of the ship. It was only visible due to the harsh rain bouncing off and pouring down its sides. In the meantime, as Ciardis stood there taking in the retinue surrounding the Prince Heir, her hair was getting soaked and the cloak over the rest of her was starting to stick to her skin. It had a water repellant spell on it, but that only worked in lighter rains. This was turning into a downpour. It was nothing compared to the turmoil in her heart. Peering ahead she had an unobstructed view of the Prince. Across Sebastian’s armor, runes glimmered with an iridescent light briefly, like a firefly in the night air, before the luminance would disappear in one spot and reappear in another on the metalwork. She stood still, staring at it, mesmerized for a second. She’d never lost the ability to see another’s magic and had even gained a better grasp of sight into another mage’s core—a Weathervane ability, according to Artis. A beautiful red cloak hung from Sebastian’s shoulders, and he’d pushed it back from his left shoulder so that it hung at an angle. He wore a white, long-sleeved shirt between his skin and the chest plate and loose brown leather pants encased his legs. As Ciardis stepped through the shield put up by the Weather Mage, she smiled and nodded over to him with that smile. As she turned to look around, from her right a woman stepped forward. She had previously stayed in the shadows and Ciardis had yet to get a good look at her. Ciardis paused what she was doing, her mind aflurry with disbelief. Even in the middle of the ocean on the deck of a ship, this woman was stunning. But that wasn’t why Ciardis’s pulse pounded in her ears and her eyes stayed glued to the woman coming forward. Power was radiating from her in the same way heat radiated from a roaring fire. The woman wore a red dress with white stitching down the front and her hair flowed in waves of amber down her back. The dress, the color of the dark red heat of a coal fire, was more than just elegant; it was the garment of a Fire Mage. Impervious to heat and fire, the weave was one that she knew well from her days as a laundress. Smith and metalwork clans heading north to supply the war had bought the fabric for their sons and daughters. It had to be meticulously handstitched and was so resistant to heat that if its owners walked into a blazing potter’s kiln, not a mark would appear on them. She’d seen it happen once. Ciardis felt the press of the wet cloak on her cold, bare arms. She began to shiver and in doing so broke the magnetic hold of the woman before her. She felt like a drowned rat in front of the woman, who chose that moment to speak. “Ciardis Weathervane?” said the woman as she placed her hands over Ciardis’s left hand, stilling it from its quest to increase circulation and warmth in the opposite arm. Ciardis felt unease drip down her spin. She still couldn’t get used to people she’d never met before recognizing her. Mirth lit up in the woman’s eyes for a moment as she said, “It’s your eyes. Even from a distance there aren’t so many around here with that color – golden like a finch’s wings.” Ciardis nodded as surprise began to overtake her unease. The woman’s warm touch on her hand was nice. Heat had begun to rise off in stronger waves from the woman’s skin; it was as if Ciardis stood next to the open door of a stove with fire-lit coals inside. Respect began to build in her. She knew that for a mage to call this much heat in the middle of a storm-tossed ocean would take lots of power. The clash of the elements alone should have prevented the woman from doing all but the most basic tasks with her fire element. Ciardis looked down at her hands, curious to see if the waves of heat were visible in the cold, miserable, gray morning. She couldn’t quite contain a gasp of astonishment, which she quickly turned into a cough into her fisted right hand. Ciardis watched in fascination as the heat emanated off the woman’s skin and flowed with perfect control into her own body which welcomed it. Looking closely at the woman’s magic, Ciardis traced the magic to the core. It was as bright as a sun, even on such a dreary and rainy day. Snapping out of her reverie, Ciardis remembered that the woman had come over to question who she was. Although it felt more like an issue of confirmation than a query. “Linda Firelancer,” the woman said in a low voice that barely echoed over the crash of waves on the ship. There was nothing in the woman’s tone that said she bore Ciardis any ill will or why she’d walked over. But that name was enough to still Ciardis and bring back flashing memories of the night Damias had died at the hands of the Princess Heir – hell bent on killing Ciardis and those with her for interfering in the inheritance rights. As she stared at the woman before her, chestnut hair falling in waves and gentle hands still capturing Ciardis’s own, she didn’t quite know what to think of the sparks that blazed in Linda’s eyes. Was it the spark of retribution or the sign of a fiery soul? In her mind’s eye Ciardis could still see the woman’s magic rippling across her hands in an intricate dance. The same heat could turn into a fiery inferno and incinerate Ciardis into a pile of ash, if she had been so inclined. She hadn’t, although Ciardis wasn’t so sure she would have made the same decision, had she been in the woman’s place. The silence stretched with a grim tension that could not be overlooked. Ciardis bit her lip anxiously as she searched the eyes of the woman whose husband she had watched die. “Thank you, I loved him with all my heart.” Careful and considerate. “I wish I had been there. Princess Heir Marissa would not have survived the night,” Linda said with a coldness that made Ciardis think that she might have ice rather than fire running through her veins. Ciardis nodded in understanding as Linda stepped away. “It was good to meet you, Ciardis. I wanted to give you my greetings personally and extend an invitation to converse further about what we had and still have in common, but for now you should join the Prince Heir,” Linda said as she turned to take her place with the honor guard. Ciardis nodded as another streak of lightning cracked overhead and the ship swayed in the ocean. As she turned toward Sebastian, she caught a glimpse of the Weather Mage frantically whispering to himself and pouring magic from his hands out into the surrounding ocean. The ship soon stopped swaying and the man visibly wiped his brow in relief. Walking toward Sebastian, Ciardis noted with gratitude that not only was she warm, but her clothes were also perfectly dry. Tucking an errant strand of hair behind her ear, she glanced over at the Fire Mage in appreciation. Then she took her place near Sebastian’s side: to his right and two steps behind, as protocol demanded. The honor guard, generals, and other courtiers arrayed themselves around them, and behind all of those on the dry deck the Imperial soldiers stood at attention in the rain. Ciardis frowned in dismay. She might not be as close to Sebastian as she once had been, but at least she could get him to listen to her. Sebastian stared straight ahead at the turbulent sea, the deck only moving slightly under their feet. Another effect from the Weather Mage no doubt, she mused. “And their armor will rust!” she added in an attempt to show a practical reason for her concern. “Their armor is weather and heat resistant. They’ll be fine; as new officers, they need to prove themselves to their leaders,” Sebastian said. He didn’t turn his green eyes on her but she imagined they were hard and distant as they watched the water churn in the dark storm outside. “It shows mindless sheep and a leader who doesn’t care for the comfort of his troops,” Ciardis retorted. “Enough,” came a baritone voice from the Prince Heir’s left. Ciardis cringed but continued to stare straight ahead. She wasn’t yet ready to give up on this topic, but neither was she willing to argue with the second-in-command of the Imperial forces. From the corner of her eye she saw a small tic in Sebastian’s right eye. Good, he’s irritated, she thought. He should be! For the moment she watched the harsh play of wind and rain as it struck the wind barrier encasing their little group. She smoothed her pursed mouth into a more acceptable smile and awaited their guest with composure. Out of the distant sky a roar sounded. It was the kind of roar that heralded trouble and made Ciardis itch for a decent crossbow. Over the last two months she had been expanding her Defense tutorials to include archery, practice with a staff as well as a glaive, and the all-important fan. She’d been taking archery lessons with the Weapons Initiates of the Imperial Guard. She knew the guard as a whole regarded her fumbling attempts to load the arrows into the crossbow with amusement. Most of the men there had been knocking arrows and hunting game since they were children. The fact that her arrow wobbled and struck dirt more often than it hit a target didn’t help, either. But her aim was getting better every day. But regardless of her clumsiness, knocking the arrow, and getting off a shot, even she couldn’t possibly miss a target this large. With a roar like that, it had to be as big as the ship. A sea monster, maybe? But no, the sound had come from up above. And of course if she so much as twitched out of step, she’d never hear the end of it from Sebastian and the Companions’ Guild leadership. Protocol was everything to them. Her heart beat fast as she strained her eyes to pierce the clouds in the sky. It was an overcast day, and it was hard to see anything farther than ten feet in front of the ship with such a heavy rain. Out of the corner of her eye she saw something, a glint or glimmer on the eastern starboard. She kept looking out of the corner of her right eye. She really wanted to just stuff the protocol and turn to the right, but damned if she did it before anyone else did. Then an excited murmur came from the man just behind her. The members of his row began to angle themselves so that they could see the right side of the ship, and Ciardis turned obediently with eagerness. They watched as the gossamer layers of cloud began to push outward and part before the massive form that flew through them. Scales, wings, and a flaming mouth peeked through in small glimpses that had Ciardis aching for a strong wind to push the dense clouds out of the way. She couldn’t stop a gasp of delight from escaping her mouth when she saw the massive form begin to descend out of the cloud layer. First a claw appeared, then an arm, and finally the full body came into view. As a dragon emerged out of the harsh fall sky, Ciardis could see that it was resplendent. Even from a distance, its scales—a brilliant emerald green—shone as if a thousand suns were above the dragon’s mighty form instead of this dull and gray day overcast with rolling thunder, clouds, and rain. As it drew closer, Ciardis felt the flesh on her skin rise in alarm. Goosebumps arose on her upper arms under the cloak and at the nape of her neck. Her magic was reacting to the presence of not only the mages surrounding her, but also the oncoming dragon—a being that could best be described as living magic. The dragon’s mighty roar sounded again as it swiftly banked its wings to glide in and land…on nothing? Sahalia’s dragons were kith, magical beings of non-human form that could wield some sort of power over the elements around them. Of course, that was what the humans called anything they didn’t understand and couldn’t beat with a stick. The dragons of Sahalia were just as fond of referring to their human allies as snacks. Sahalian dragons were immortal, powerful, and vain creatures. Their pride was said to be their weakness. In Ciardis’s awestruck mind it could only be their strength. The dragon in front of her was gorgeous. And heading straight into the open water. What could it be thinking? It would fall directly into the water. If the envoy drowned, relations between the Algardis Empire and Sahalia would be ruined. Frowning, Ciardis continued to peer doubtfully at the approaching dragon. It was coming in quite fast, although it was still a long distance off. He chuckled while unlocking her fingers. The closer it flew, the more of its wingspan she could admire. Mighty horns arrayed the top of its head like a crown. From wingtip to wingtip, the dragon was easily the size of the three-masted ship she stood on. Each wing had a fine bone structure, like the bats that dwelled deep in the mountain caves of Vaneis and only emerged at night to hunt the bugs in the countryside. Between the bones of the wings was webbed skin on the underside and layered scales on the other. The scales on its belly and neck were a luminescent pearl color while the scales on its back, wings, legs, and head were the same shade of green she’d admired earlier. It was a beautiful sight to see. Nervously the man nodded, perspiration dripping down his forehead in the dry confines of the wind shield he’d erected. The other people beneath the shield, even Ciardis, were dry and warm. Perhaps the momentousness of the occasion was making the man nervous? It wasn’t often that a Sahalian dragon made an appearance anywhere near the Algardis Empire. They didn’t view humans as equals, and given the history between Sahalia and Algardis after the empire’s founding, preferred to stay away. Ciardis eyed the Weather Mage more closely. Her mouth set in a thin line as she glanced back and forth between the oncoming dragon and the man set to smooth its way. She was loath to take her eyes from the magnificent dragon but the Weather Mage looked almost…ill. He stood, swaying slightly, as if the spell he’d made to steady the ship had no effect on him. Pulling a looped chain from under his robes, he picked up the talisman at the end. The Weather Mage stepped forward through the edge of the wind shield and into the downpour on the deck. Once he reached the ship’s rails, he lifted his hands from the talisman and pushed outward. As his hands pushed outward, the sleeting rain surrounding him arced backward as if pushed by an invisible wall. Quickly the wind shield grew larger, encompassing first the entire ship and then the ocean immediately surrounding it in a circle. With a short nod to himself, the Weather Mage licked his finger and held it up to the sky. Was he testing the wind? Or changing the current with such a simple gesture? It didn’t look like anything significant was happening. He licked his lips nervously and Ciardis knew something was wrong. No, thought Ciardis. He’s stalling. And yet he’d completed one task successfully. She slipped into her mage sight to get a gauge on his core. Even from a distance she could see the power in his mage core dwindling rapidly. The Weather Mage couldn’t possibly be able to stabilize such a turbulent natural force as the ocean in the midst of a gale. She wasn’t an expert on weather magic but even she could see that he couldn’t do another task as momumental as the one asked of him with his depleted core. The next minute, the Weather Mage stepped back from the rail and looked over his shoulder at the gathered retinue. He gave a short bow to the assembled group, specifically looking at Prince Heir Sebastian for acknowledgement. Sebastian gave a short nod in return and turned aside to speak with the waiting general of the Imperial forces. The Weather Mage turned back to his task, and just for a moment, fear swept over his face. He picked up the talisman again. Even though he was still facing her, Ciardis couldn’t see the markings on the disc he held at the end of a length of a gold chain. She wasn’t close enough to figure out if it was the relic she thought it was, and, more importantly, if it stored magic. Glancing sideways, Ciardis noted that Sebastian was still speaking quietly with his compatriot. She decided to see if she could escape notice and leave. Unfortunately for her, while she and Sebastian had been apart for weeks, he was just as aware of her every movement now as he had been when they’d been miles underground in the vale near the White Mountains while trying to reach the cavern of the Land Wight. He didn’t move an inch but she felt his presence reach out. They couldn’t talk mind-to-mind now that he’d released her hand. But she could still sense his concern. Oddly enough, that momentary feeling of worry was enough to soothe her anxiety about them. It showed that underneath that cold, princely exterior he hadn’t changed. He was still the same boy she’d walked through fire for. Although he managed to surprise her this time. Months of no contact and it was almost like they hadn’t been apart at all. With a wicked grin that he couldn’t see, as he was still turned aside to face his compatriot, she opened her thoughts and send him a mixture of emotions—happiness and a wicked sense of amusement. Don’t worry. I won’t get into too much trouble, she thought fondly at him. She knew he wouldn’t be able to hear her thought, but still, the emotions would flow through the link. Firmly, she elected to focus on the present and pushed the swirl of feelings from Sebastian away. As they faded, the dread that pooled in her stomach began to take precedence. Taking in the Weather Mage’s shaken form, she realized she had a bad feeling about this…a very bad feeling. Edging sideways with a whispered, “Excuse me, pardon me,” she eased around the gathered officials and towards the Weather Mage’s side. “Stand here. Wait for my signal,” the Fire Mage said. Linda walked over with a no-nonsense look on her face to the Weather Mage’s side. He had yet to follow the Prince Heir’s second command to steady the ship, which was swaying side-to-side erratically. And the wind shield was beginning to falter, as well. To make matters worse, holes were forming in the shield and gusts of sharp wind and rain would come through the holes and rip across the deck in a fury. As people started to stumble back and forth, they began to murmur disparagingly about the talents of the hired Weather Mage. Ciardis was more worried about his health than talent. Any mage under this much stress, battling Mother Nature herself to force calm when the weather was anything but still, would need to be an excellent practitioner, powerful and prepared. And this man seemed to be anything but ready for the task. As Ciardis watched the planks across the decks tremble, she noted that the Weather Mage seemed to be losing his grip. Whatever Linda was going to do, Ciardis hoped she was able to do it fast. Meanwhile, a second roar shattered Ciardis’s focus on the Weather Mage and brought it back abruptly to their oncoming guest. Staring at the dragon Ciardis saw the most curious thing. It was hovering. Its wings weren’t moving and neither were its legs. How the massive beast was staying in the air was a mystery to her. But she decided to file that away for another time. It was still vocalizing its displeasure. Ciardis wasn’t exactly sure what the dragon was roaring about. She spoke Sahalian, thanks to a certain Companion, but this roar wasn’t in the dragon tongue of the Sahalian courts with the fluid language and subtle hisses of its consonants. No, this was primal. The roar was the natural language of one dragon to another, and something that no other being could translate. That didn’t mean she didn’t understand anger when she heard it. And then suddenly it was moving again. The dragon banked its wings and prepared to land on the water. Incoming with its wings spread like that, it looked like it planned to grab onto the ship with the claws and rend it to pieces or so sink it, whichever came first. No one on the deck looked anything but calm. Ciardis tried to emulate their serene, well-practiced looks, but she wasn’t a convincing liar on her best days. In fact, she’d been told quite a few times that the only reason she hadn’t been outright assassinated was because her enemies were convinced she couldn’t manipulate herself, let alone someone else. She’d like to keep it that way. She had enough problems as it was with people trying to kill Sebastian without adding her own assassination to the list. Then the dragon began to glow. Ciardis went pale. He was about to cast a spell. Secret glances at the honor guard around her, including three battle mages, told her that they weren’t worried. Their visages were calm and steady, each stood with hands folded in front of them, and all courteous attention was being paid to the dragon envoy. That didn’t mean she wasn’t worried. Then suddenly a small ball of blue flame winked into existence at her feet and winked out again just as quickly. Ciardis was certain she was the only one who had seen the flame appear and disappear. She glanced over at Linda’s direction and saw her pointedly staring at her. I guess that was my signal to get over there. I’m so nervous but at the same time SO excited!!!! Still my nerves have kept me going this far! I hope it was worth the wait! Love & Hugs! Easy peasy to enter. Just share this post, or the facebook post or any of the retailer links and let me know right here you did so. I will choose 5 random winners of signed copies of Sworn To Transfer on October 1st!! And don’t forget BOTH BOOKS ARE ON SALE! Sworn To Raise (Courtlight #1) is still temporarily only $.99 cents! While Sworn To Transfer (Courtlight #2) is $2.99 until October 1st! TEN DAYS until the release on September 20th! *This passage was in the opening chapters and focuses on the struggle of Ciardis with the demands of her duties as a Companion trainee in the courts. I decided it was superfluous and tossed it. In fact, being a Companion trainee was harder than it looked, and Serena would not let up on pestering her about the opportunities for a properly placed Companion to convince her Patron of the need for a new special incentive tax to benefit the Companions’ Guild. Baring her teeth in the rain and as she clutched her cloak around her Ciardis shook her head at such foolishness. The very last thing Prince Sebastian wanted to hear from her was a plea for a people’s tax on behalf of the Companions’ Guild. Of that she was quite sure. Besides it was a stupid idea. Who would they tax? The poor people in Bedlam’s Bottom? The ship captains who docked at the port with stores of grain and oil? Or how about the fur merchants traveling from the far North? No, Serena needed to find another way of getting extra funds for whatever project the Companions’ Council had come up with. Or host a ball…now that was an idea. A ball with the express purpose of raising money from attendees. The nobles and wealthy socialites were always looking for the next fabulous event to attend the capital and they thought of nothing of spending fifteen thousand shillings on their latest extravagant gown with beading and feathers and jewels and who knows what. She’d seen a dress last month which had been festooned with the long black feathers of rare island sand birds. They were illegal to hunt and extremely hard to capture. The duchess who’d worn the feathers could have paid for all of the poor of Bedlam’s Bottom to receive beef soup and bread for a month with such a costly gown. As part of the blog blitz for the release of Sworn To Transfer, there’s a new massive rafflecopter giveaway listed on all the blogs. I wish I could embed it here but unfortunately wordpress.com doesn’t support that. I’m giving away copies of both books, posters, bookmarks and an Amazon or Barnes & Noble giftcard!